Sometimes we want to have a banquet-like meal, sometimes we just want a simple one to balance our diet. 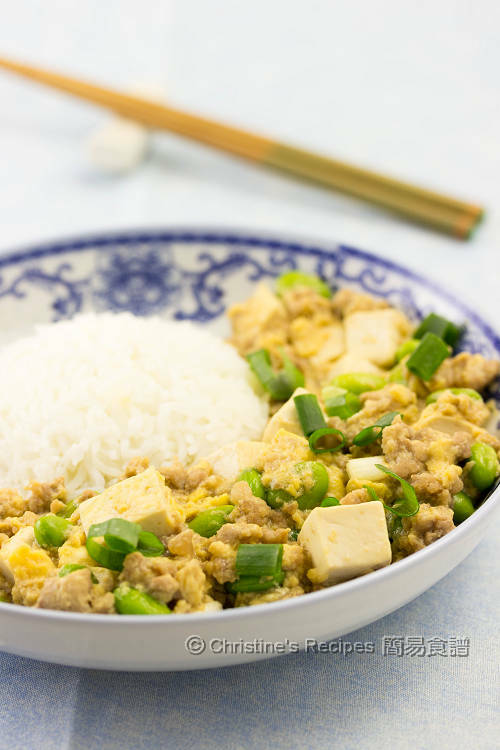 This tofu and pork mince rice dish is so quick and easy to make. As Hongkongers, we are quite into this kind of one-plate rice dish (碟頭飯) that provides with enough proteins and nutrients. 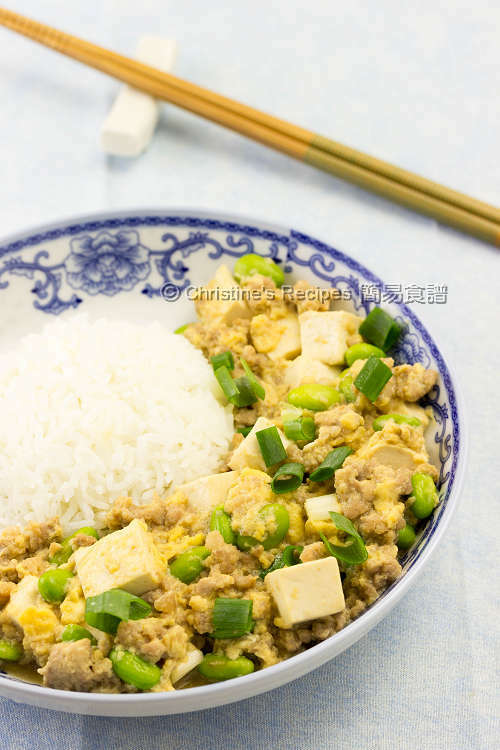 Pork, tofu and eggs are basic kitchen staples in Chinese cooking that I often stock a certain amount in fridge for whipping up our daily meals. Edamame beans (aka fresh soy beans, called 枝豆 / 毛豆 in Chinese) are my all-time favourite food. You might’ve enjoyed these little lovely and delicious beans in Japanese or Chinese restaurants. They are tasty and nutritious, full of proteins. I found these beans are wonderfully fantastic for making this dish. This rice dish is also excellently suitable for packing lunch back to school or work. Mix the pork mince with the marinade. Don’t stir it too long or too hard. Just combine all the ingredients. Set aside for 15 minutes. Blanch the tofu and Edamame beans in boiling salted water for about 1 minute. Carefully drain them out. Rinse the beans with cold water. Set aside. Saute the garlic over medium-high heat. Beware not to burn them. Quickly add in the pork mince. 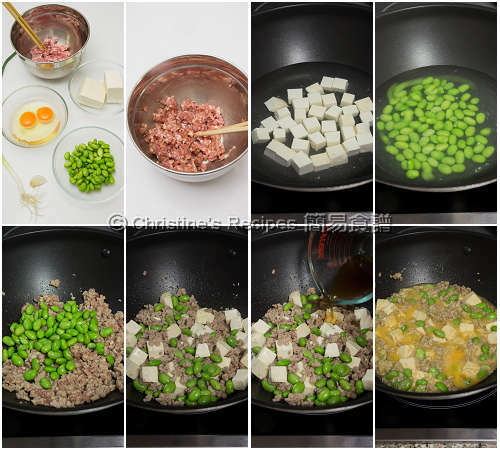 Use a spatula to loosen the mince up and cook until its colour is changed. Add the beans. Stir to combine. Add tofu. Pour in the sauce. Bring it to boil. Add the thickening and cook to your preferred consistency. Pour in the whisked eggs. Use a spatula to push the egg back and forth. Stir to combine with other ingredients very well. Garnish with spring onion. Serve immediately with rice. 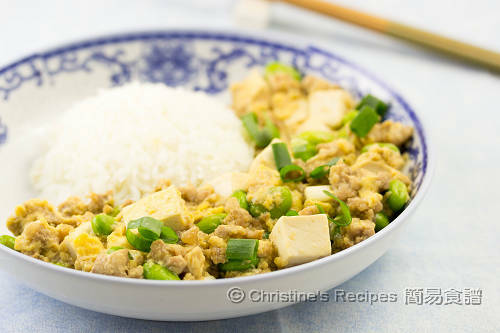 By briefly blanching the tofu in salted water, it won’t easily be broken apart while stir frying. The Edamame beans will keep its green colour after blanching and rinsing with cold water. Try not to overcook the whisked eggs, then it’ll be very smooth. This is a homey and delicious dish. Perfect to go with rice or even as a filling for flatbread. Same to you. Have a great weekend, Angie. Hi Christine, basically I don't like to cook. But looking at your recipes it really inspired me to cook more often for my family. I can imagine how it tastes like haha... thanks and keep inovating Christine. Glad to hear that my recipes inspired you. Happy cooking !